China Eastern finally gets funky! 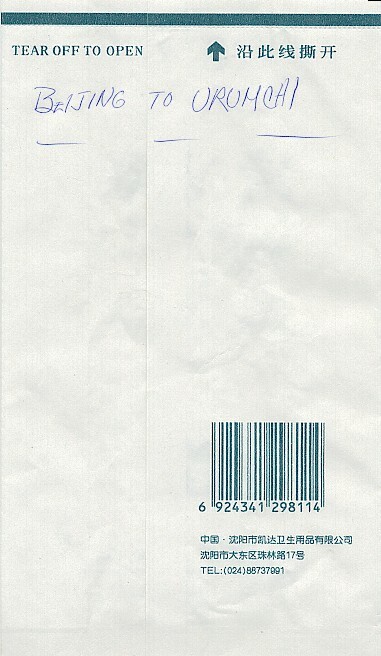 They start to have some fun with their bag, by placing a short stubby cartoon airplane on their bag. 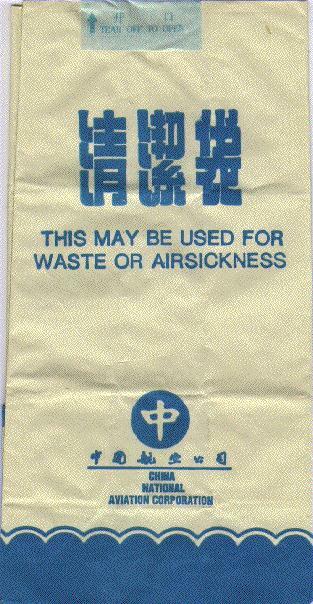 This is the first Chinese bag I'm aware of with this kind of whimsy. 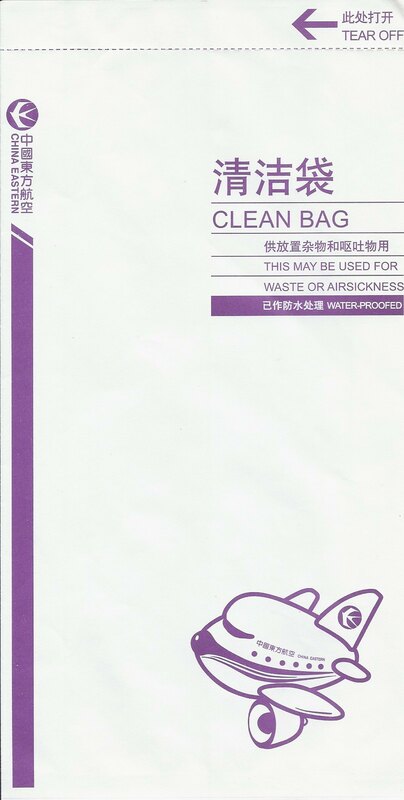 notice how this bag is correctly 'WATER-PROOFED'. 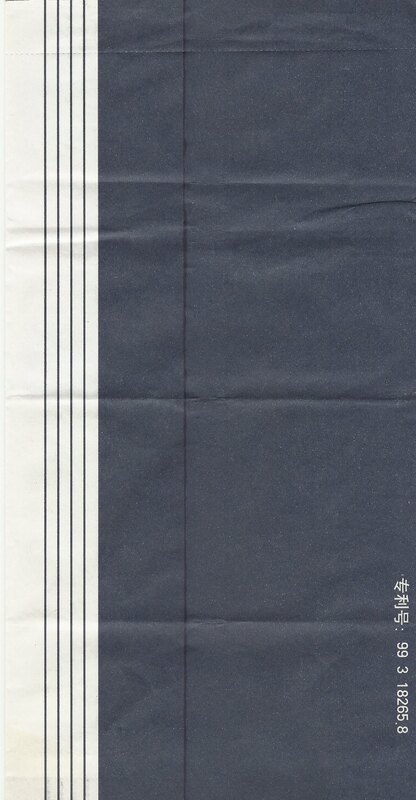 This is identical to the other 2004 bag on the front, but the back is completely Navy Blue, plus there's some printing in the crease. China Eastern's playful stubby airplane evolves into a more mature stubby airplane. Identical to other 2006 bag except there's a block printed on the back. China Eastern's playful stubby airplane evolves into a more mature stubby airplane. 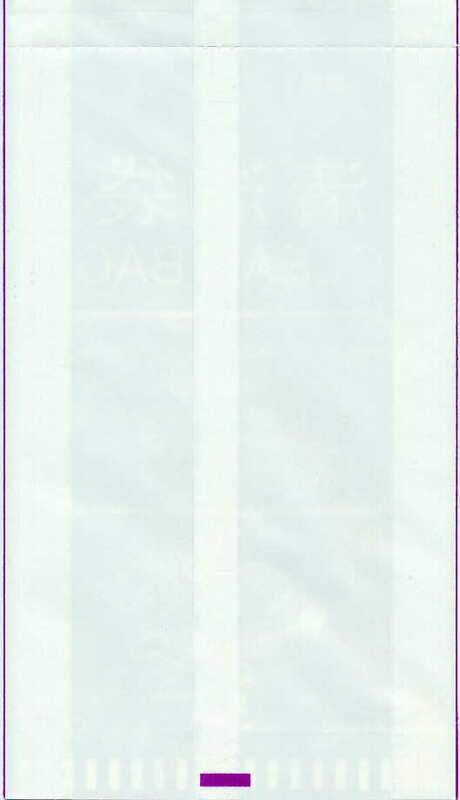 Identical to other 2006 bag except there's no block printed on the back. 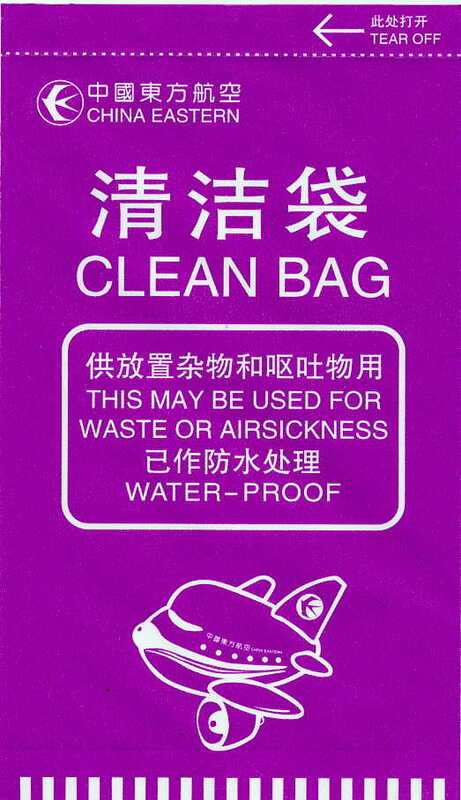 Identical to China Eastern's other playful stubby airplane except notice how this bag is 'WATER-PRFOOED' instead of 'WATER-PROOFED'. 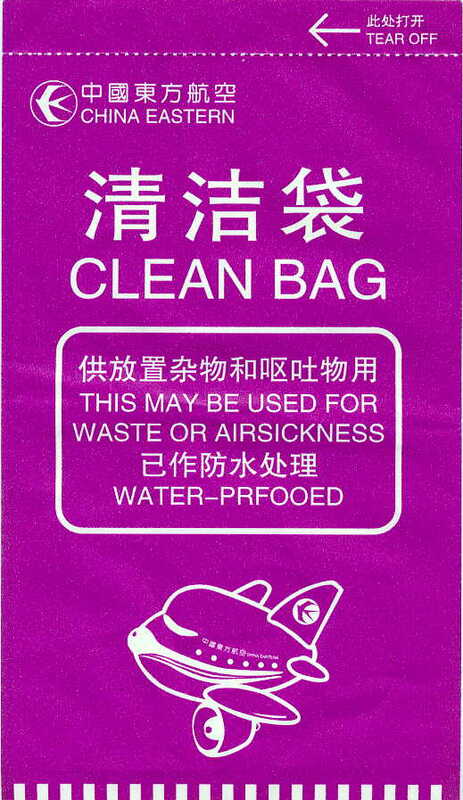 China Eastern keeps the playful stubby airplane, but still can't quite spell "Waterproofed".  This gem uses "WATER-PROOED". 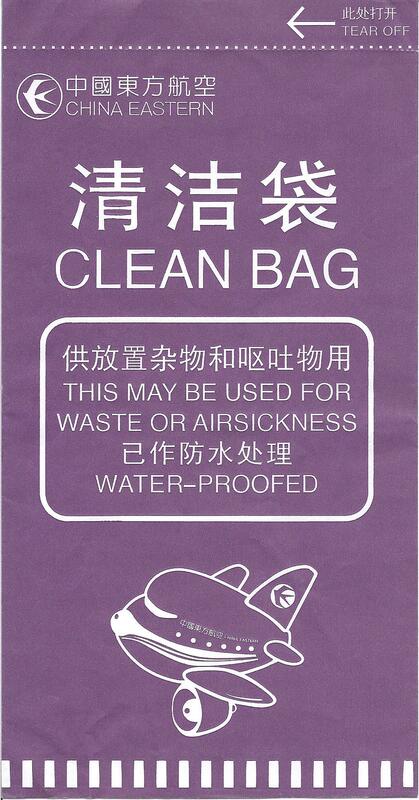 China Eastern finally spells Water-Proofed correctly. Oh happy day! 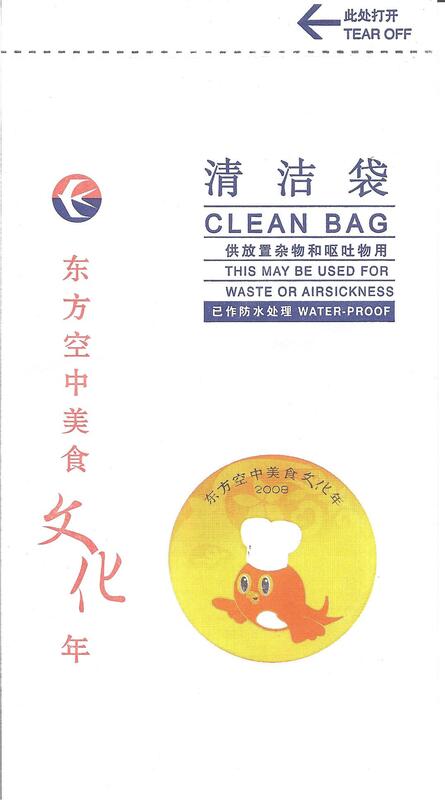 This is a great variation on the boring China Eastern Bag as this features a fish in a chef hat, which presumably will commit suicide and after death serve itself up on a plate to discriminating flyers. That's my best guess anyway. 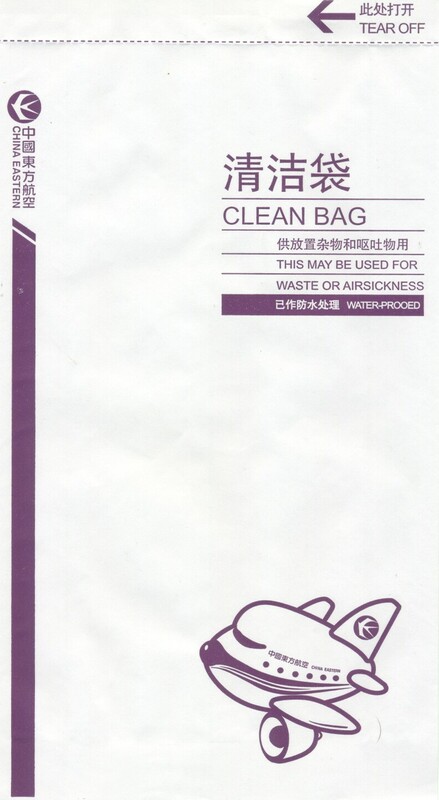 China Eastern continues its march towards minimizing their bag design.  What used to be big ostentatious images and text is getting smaller all the time. If you look in the gusset, this bag says alibaba.com, unlike other seemingly identical China Eastern bags. If you look in the gusset, this bag says joyum.com, unlike other seemingly identical China Eastern bags. 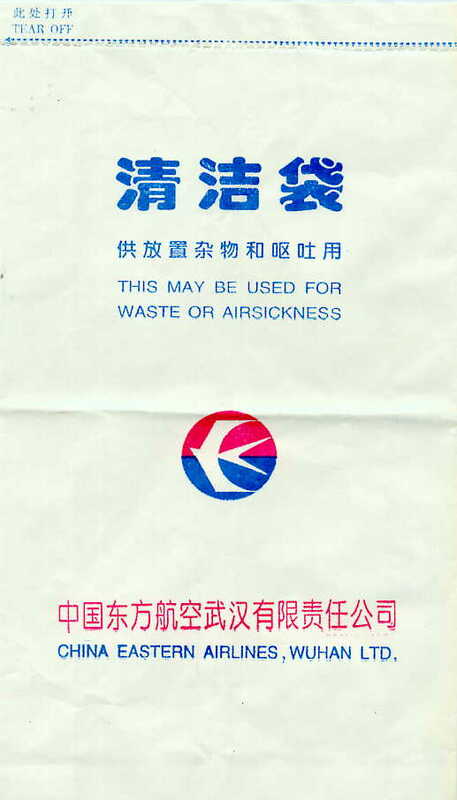 If you look in the gusset, this bag says tlfzsy.com, unlike other seemingly identical China Eastern bags. 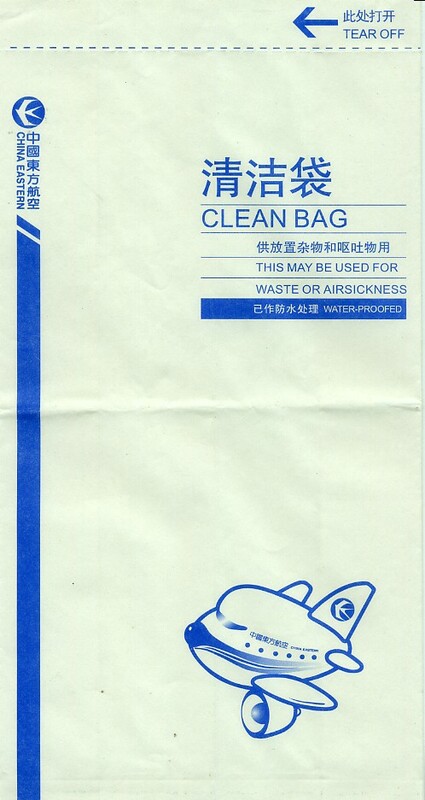 Identical to China Eastern's other playful stubby airplane except notice how this bag is 'WATER-PROOFED' instead of 'WATER-PRFOOED' or 'WATER-PROOF'. 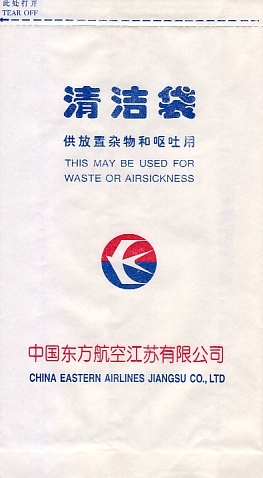 Looks like all the other China Eastern bags, but this one is specifically for the Jiangsu region, I think. 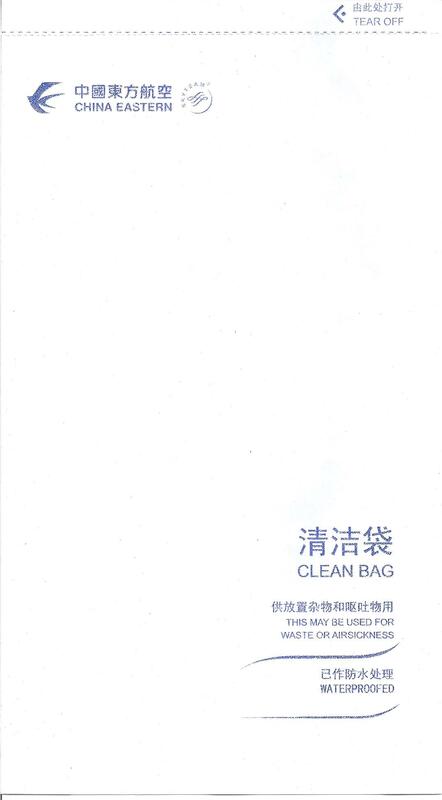 This bag features the longest Chinese word in the world, spanning 14 symbols. I have no idea why China Eastern mentions Wuhan, but perhaps it's a corporate takeover of some sort. Perhpas you know? 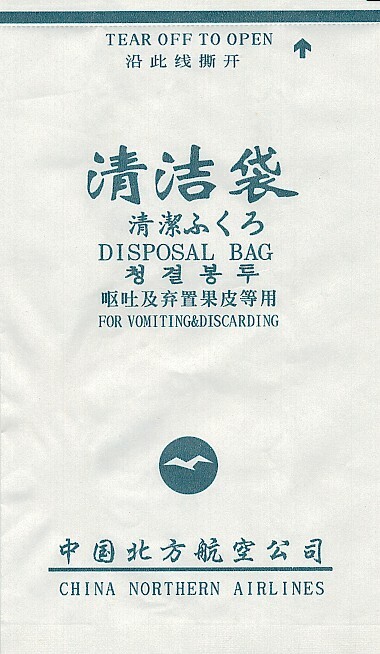 This bag is a lot like the other China Northern bag, except notice how 'FOR VOMITING&DISCARDING' is so squeezed in. Plus 'tear off to open' has moved on both sides of the bag.  Also, the telephone number on the back changes. I'm not sure if this is a bird in front of the moon or snow capped mountains. 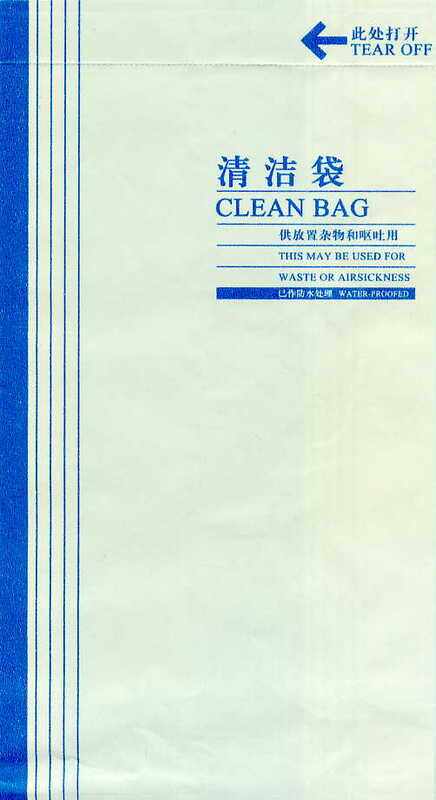 Also, a green Chinese bag? What's going on? 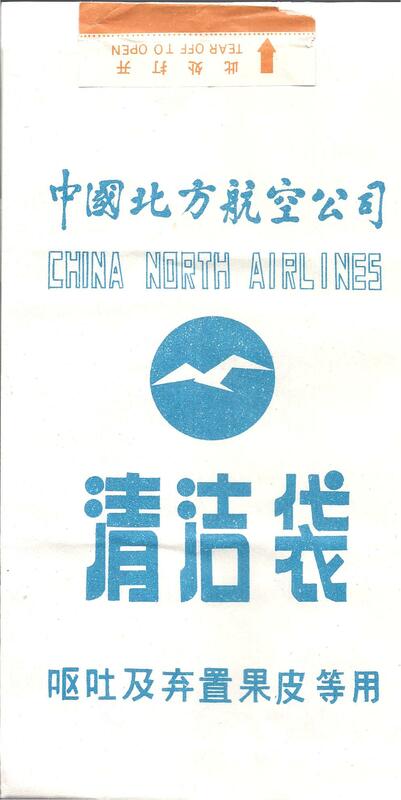 Although this bag says "China North Airlines" the English name is actually China Northern Airlines. 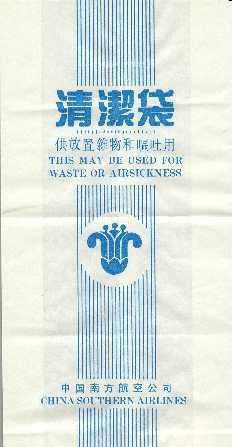 The bag is primarily in Chinese, meaning that English had yet to infiltrate the country and take over the copy on barf bags. 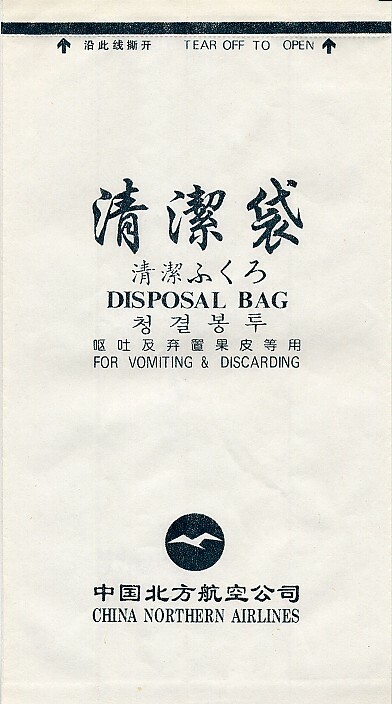 Same as the 2005 version except now they show the universal "guy throwing trash in a wastebasket" symbol for those that were previously baffled by the bag's purpose. 21 vertical lines on the bag. Lotus flower logo. 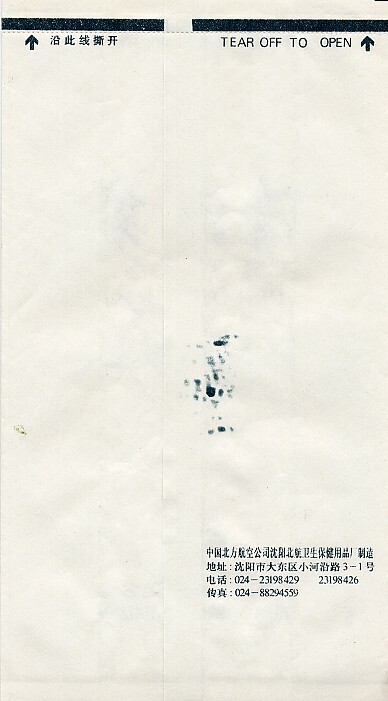 Nausea stud, Y.L. Tan chimes in that the flower is not a lotus. It is a stylized kapok flower.